The former British No. 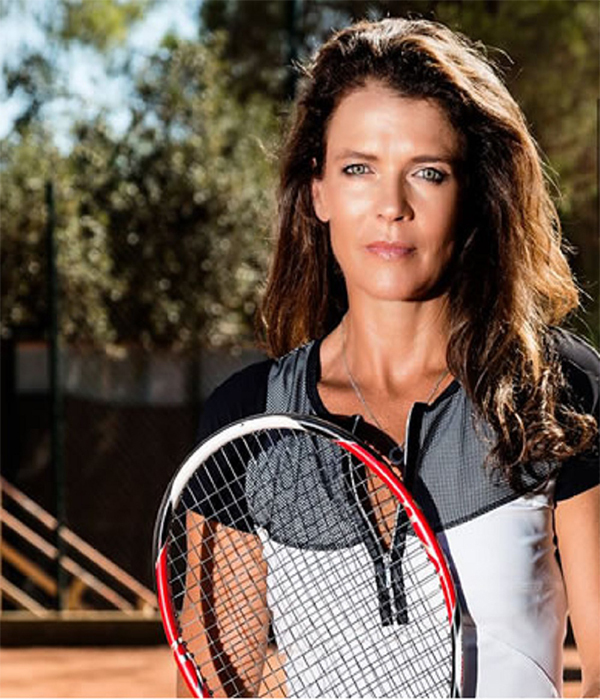 1 female tennis player on Banksy, Bjorn Borg and Roger Federer, the most beautiful player she has ever watched on court. A: I started on a family holiday in Spain aged nine-years-old and joined a group tennis lesson at the hotel. I loved it so much, then bombarded my mum repeatedly to carry on playing when we got back to England. I joined the local tennis club in Bromley, Kent and went for a weekly group lesson, which cost 50p back then! I desperately wanted to win the colourful wristbands that were up for grabs as prizes. Q: What attracted you to tennis? A: Probably watching Bjorn Borg who was this gorgeous Swedish superstar of the game. I queued for hours to watch him in the then standing room only on Centre court. A: A roll of loo paper, tinder box to light a fire and probably a knife to build a camp among other things. A: I try to create my own motivations and not just follow like a sheep. I question lots in life all the time and seek answers myself. However, I do follow Banksy (@thereaIbanksy) on twitter and love the inspirational quotes and tweets. A: I LOVE everything about London. It’s the most incredible city, full of art and culture. Stunning architecture and historical buildings, a river running through it and amazing restaurants. There are lots of theatres to enjoy, too. One of the best cities in the world. Q: Tell us a little about the ATP World Tour Finals? A: It’s an event that hosts the top 8 players at the end of the season, who battle it out to win one of the most prestigious events on the tour. All year long players try to win enough points to make it to the 02 event. It’s a well-attended event with a glamorous feel to it. The audience are in darkness and the court is lit so it’s a bit like watching a boxing match. There’s smoke and music and a real buzz about the atmosphere. Q: What is one of the funniest things that has happened when you have been playing tennis or presenting live? A: Well, there are always many things that go wrong in Live TV, but once my director and producer were having a blazing row in the gallery. All the while, I was calmly trying to interview a guest. Very amusing at the time and not something I will forget. Q: Are you working on any other new projects at the moment? I work at our tennis Academy “The Annabel Croft Tennis Academy” (www.annabelcrofttennis.com) which organises tennis holidays for all ages and abilities to some stunning locations. Q: If you could play tennis against anyone, who would it be? A: I would probably choose to play Roger Federer as he’s the most beautiful player I have ever watched. It’s like watching a dancer on stage or an artist paint. There won’t be another quite like him for a very long time. Q: What did you eat before a tennis tournament and anything as a reward afterwards? A: I used to eat fish and green vegetables and healthy clean foods. Although, I must admit I do remember indulging in a horrendous ice cream Sundae to wallow in a bad loss a few times. A: A traditional house with a log fire burning in winter and a big open-plan kitchen for all the family meals with friends and family – maybe overlooking water to enjoy eating outside when the weather allows. It would have a yoga terrace as I am completely obsessed! A: Well, before we built our house, we were living in a place that was going to be knocked down! My husband and I always vowed we would not spend a penny on it, and then one morning the kids ran upstairs and said that the sitting room had water bursting out of a radiator. Mel [my husband] just took a spanner and locked it off and threw the radiator out of the window. We then had no heating for that winter which was horrendous. I now appreciate being warm. A: I love Julian Chichester (www.julianchichester.com) and Andrew Martin (www.andrewmartin.co.uk) furniture. Q: Where is your favourite place to play tennis and do you have a lucky racket? Q: What advice would you give to any rising stars, who wants to take up tennis professionally? A: Work hard and accept the defeats as part of the learning process. You will always learn more from a defeat whatever walk of life!